To make a donation, please fill out and send back this form, or refer to the other options on this page. To become a Participating Member, please send us an email at info@bdti.or.jp and we will explain the details. We will be very grateful for your support. We increased the number of persons who attended our director training courses; received our e-Learning; or were reached via seminars, speeches, or other meetings, as shown in the attached overview materials and as reflected in this historical list of programs (which unfortunately excludes most English programs). The number of intensive, interactive sessions continued to increase. We saw a strong increase in the number of companies that asked us to provide customized training, including some firms that are considered among the best in Japan. As shown, companies that have received training from BDTI tend to out-perform TOPIX in the stock market, though of course the direction of causation (if any) is unknown. (But on a subjective basis and to no surprise, we observe that better-managed firms tend to take governance-related training seriously.) As you can also see in “vignettes” in the materials, healthy attitudinal changes regarding governance and training are now underway on both corporate boards and in the bureaucracy in Japan. Among other trends, it is clear that our promotion of director training as an essential practice since 2010, as well as my success in getting the topic included in the CG Code, have succeeded in bringing more providers of board training to the market. I would guess that a Google search in Japanese now results in twice as many firms that claim to provide director training as was the case four years ago, although admittedly the depth and topical coverage of some programs may be lacking. Despite these positive overall trends, the management magazine Keiei Houyuukai conducted a survey of director training activities which concluded that: “the incidence of director training was 53.9% for internally promoted board members at respondent companies, and 28.9% for outside directors. Considering that 73.3% of the respondent group consisted of companies with consolidated revenues of at least 100 Billion Yen, it is hard to escape the impression that these levels are low”. The survey also showed that at 50% of respondent firms, the length of director training (even when it existed) was less than three hours, and that training about important topics related to “governance practice” and “finance” was not common. For example, at only at only 25.3% of respondent firms did training cover risk management and crisis management; at only 13.1% did it cover the Corporate Governance Code; at only 21.2% did it cover finance and accounting; and at only 7.1% did it cover corporate value and valuation topics. (a) With the coming of a consumer products class action law in Japan, we organized a “Class Action Risk Management Study Group” led by experts in the field, which produced a detailed report educating Japanese companies and their legal counsel about class actions and how to deal with potential lawsuits. This report is now being published not only in our Discussion Forum, but also (in three parts) in “New Business Law”, a well-known legal magazine here in Japan. (b) On behalf of CLSA, I wrote a 60-page “Blue Book” entitled “Serving Notice”, which is basically a primer for investors on corporate governance law and practice in Japan, and what I call “efficient engagement”. At the end I included sample “efficient engagement” letters in English and Japanese (same content). (c) We continued our joint analysis with METRICAL regarding governance scoring and the correlations that exist between various practices/actions and corporate performance. This sort of analysis is essential in order to make engagement in Japan more effective, because it can give investors more confidence (evidence) in asking companies to adopt the most important practices, as described in the aforementioned letter. As of April 2018, our analysis was updated for the roughly 1,800 publicly traded companies with market capitalization exceeding about JPY10 billion, thereby yielding more robust results. For instance, there is a significantly positive correlation between: (i) incentive (compensation) plan adoption and ROE; (ii) nomination committee adoption and Tobin’s q; and (iii) the percentage of independent outside directors and Tobin’s q. As before, it appears that there is financial out-performance when the number of INEDs is greater than 50%, even though the number of such firms is small. (Analysis by METI suggested the same conclusion regarding nomination committee formation. Please contact us if you are interested. ) You can read a description of other major conclusions from our analysis on this post in BDTI’s Discussion Forum. However, these results have already been superseded by this most recent PPT presentation as of June, which contains much more detailed results and found other interesting correlations. It is probably best to read this first. Recently, we assembled a powerful workstation to collect data and use AI techniques for text mining and analysis. We are now conducting research on a multi-year basis to capture trends and changes over time. Our intention is to analyze governance practices at a deeper level, but how deeply we can do this partly depends on whether the JPX/TSE improves its XBRL format for the “disclosure items” in its CG Reports. We hope and anticipate that our activities will stimulate the provision of more detailed data sets by commercial data providers, simply by showing what is possible. We are indebted to PacificData for the provision of top-quality, detailed financial and accounting data covering all Japanese publicly-listed companies that is allowing us to explore these exciting initiatives and nonprofit research activities. We are also grateful for data contributed to us by Chi-X Japan. We created an English version of our Japanese disclosure search engine, which provides convenient access in one place to all the various kinds of disclosure put out by any company, including securities reports and other FSA filings of all types including financial reports and voting results; JPX/TSE governance reports; company web site disclosure such as governance guidelines, convocation notices, integrated reports, environmental reports; and diversity reports submitted to the MHLW, etc…. in short, essentially everything. On the English search engine, one can first check to see if any of these documents exists in English, and then can switch to use Google Translate to search (in English) for the documents that are only available in Japanese, and proceed to conveniently get a rough translation of them which can be cut-and-pasted from. PDF documents (or links) can also be translated, including any files that you may have saved to your PC. One can also use Google Translate to search for the original Japanese documents using the Japanese search engine, which may be more effective for that purpose. The English and Japanese search engines also enable users to convert JPX/TSE governance reports and EDINET Yuho securities reports to Excel files (the latter, coming soon). Drop-down instruction pages are provided, but supporters are very welcome to contact us by phone for tips on how to use the search engines to best advantage. Please use skype if you can, so we can show you on a PC screen. When we have time, we hope to make YouTube videos to explain how use all the functions. The search engines are still in their “beta” versions, but are steadily improving and “learning” as more people use them. We will soon be opening up our BDTI Director Bank for free access by any corporation (including institutional investors), and for CV listings by individuals who have taken one of BDTI’s intensive director training programs. We are currently in the process of modifying our web site for more convenient online registration, in tandem with this change. The Director Bank’s footprint is still small in terms of numbers and usage, and by making it entirely “free”, we hope to change that. 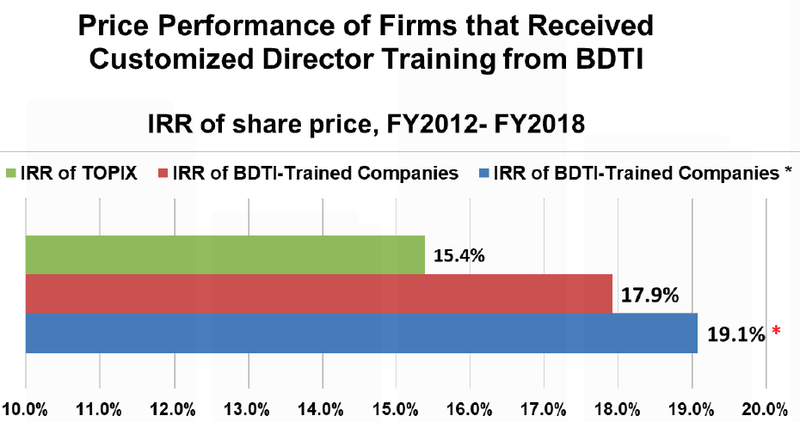 BDTI tries to use each Supporter’s contribution as efficiently as possible to provide director training courses and otherwise raise awareness about governance and best practices. Our tiny office is run out of three small rooms in my home. Similarly, we minimize expenses by using facilities for programs that are either free or low cost, donated by Supporters such as Cosmo PR and Tanabe & Partners. This year, total donations increased once again, and among other milestones we added two important new types of Supporters: (a) our first U.S. public pension fund, The Employees Retirement System of Texas; and (b) our first corporate member which is an institutional investor planning to suggest to its portfolio companies that they take advantage of 40% discounts for BDTI’s “open” programs (Usonian Investments LLC). Please let us know if you interested to support our activities in this way. This year, we are hoping to receive support from major Japanese institutional investors, who so far have been meek about supporting “director training”, even as they express their commitment to ESG integration and “good governance” in general. As the number of our foreign supporters increases, the likelihood of major domestic support increases. This year, BDTI was the subject of a closeup article by Nikkei Sangyo Newspaper on how Tokyu Construction received director training from BDTI. I was also frequently quoted in both the Japanese and the foreign press on a number of governance issues, most importantly in the Nikkei Newspaper with respect to the issue of discouraging the appointment of former directors as “advisors” (sodanyaku, see point 3 below). I wrote this article in Ethical Boardroom on the most important next-stage reforms that policy makers need to follow through on, and this article in the Financial Times stressing the importance of corporate pension funds signing the Stewardship Code (see below, item (1)). The May 2018 copy of the Japanese magazine for human resource professionals, “The Company and H.R.” （企業と人材) included a 5-page interview of me in which I explained BDTI’s views of the important roles of directors and the types of skills and knowledge they need to perform them. As of this writing, I have just been interviewed by the Japanese magazine “Weekly Diamond” (週刊ダイヤモンド) for part of a special edition it will publish regarding the upcoming AGMs in June, and corporate governance trends. My efforts since 2015 advising policy makers to encourage corporate pension funds to sign the Stewardship Code (SC) bore fruit this year. See also this article in the FT. As a result of an inter-agency study group formed in response to my 2016 proposal to the Ministry of Health, Labour and Welfare (MHLW), Secom is now no longer the only non-financial corporate pension fund to have signed the SC; they have recently been joined by Panasonic and Eisai. It is now predicted that many major companies will join them in the next year or so, a very symbolic and important step forward for Japan’s equity market. This is all the more so because the revised CG Code (as a result of the study group born from my proposal) contains an entirely new Principle 2-6 which asks companies to make sure that their pension funds attend to the stewardship duties by staffing them with competent staff and supporting their operations and monitoring of fund managers, and disclosing their setup for doing so. The related “Guidelines for Investor and Company Engagement” also refer to this responsibility. After many years of my urging policymakers (including a Viewpoint by the American Chamber in Japan) that the GPIF should mention Japan’s own Corporate Governance code in its investment policy, to its great credit the GPIF did exactly that last year, by encouraging its asset managers to follow “the corporate governance codes of individual countries” in both its Stewardship Principles and its Proxy Voting Principles. This is great progress and the GPIF should be commended for this important move. This is a topic I led the lonely charge on, and in fact have been chasing ever since 2014 when I advised the FSA on the contents of the CG Code and recommended them to require detailed disclosure about all “advisors” who are former directors in CG Reports. In 2015 I coined the expression “ghosts in the boardroom” to describe the often-pernicious effect of such advisors, and momentum against them in public opinion and among investors began to steadily build. Then, in August of last year, the JPX/TSE made this announcement asking companies to disclose certain details of “advisors” (sodanyaku or komon, etc.) who were previously CEOs or served as Representative Director. This is major progress, and in coming years I expect the disclosure requirement to be expanded to any and all former directors. After I suggested the concept to METI in early 2017, METI proposed exactly that to the Ministry of Justice’s Legal Affairs Advisory Council for amending the Company Law. (Note: the upcoming amendment of the Company Law is supposed to prioritize improvement of governance.) Later in the year I led a committee of the American Chamber of Commerce in Japan (ACCJ) which submitted a Viewpoint, and after that, a Public Comment, proposing the same thing and elaborating on why it is so essential in order for boards to be able to appoint or replace CEOs and other executives on a timely, objective basis. 7. Regarding Revision of the Machine-Readable Format of Corporate Governance ReportsAfter the public comment process, the new CG Code has just been finalized (June 1st, 2018). 7) Submission to the FSA’s “Working Group on Corporate Disclosure. In response to the FSA’s call for input from the public, I wrote a 15-page opinion letter in Japanese for the FSA’s “Disclosure Working Group”, ringing a detailed warning bell (with many examples) that Japan’s corporate disclosure systems in general are not ready for the age if AI-based data collection and analysis. I am sorry that do not have an English translation, but would be pleased to explain the major points if you call me. The Japanese version that I submitted is on BDTI’s Discussion Forum.